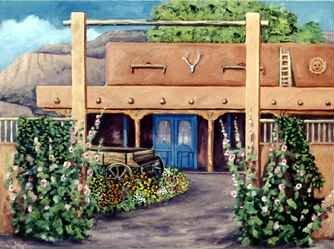 Historic adobe hacienda and guest house on 3 acres in the North valley of Albuquerque. Step back in time when you turn into the courtyard and begin your visit. Wandering the grounds will lead to gardens of colorful flowers that scent the air and brighten your spirit. The sound of the waterfall is music as it cascades lazily into the lily pond. One path leads to our family of horses, pygmy goats, chickens and of course the barn cats Fluffy and Raven. The 1840's wagon complete with hay bales is great fun for pictures. Every season has its' own magic and we wish for you to share our home and experience the special warmth and beauty of this truly "Enchanted Land".